Hugo Borst (author) & Oscar van Gelderen (publisher) love Rotterdam, Joy Division, Cornelis Bastiaan Vaandrager and football, and are passionate about art, with a special knack for outsider art. We love spotting new (often young) talent, but what we love most is correcting (art) history: add lustre to overlooked or forgotten artists, or to artists that we think deserve a little push. 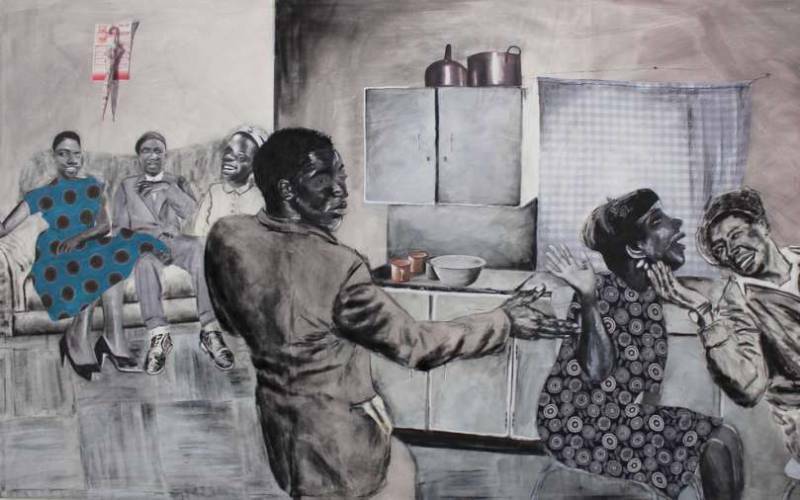 We also buy art together: we acquired a monumental work by Neo Matloga, recently graduated from De Ateliers, and winner (alongside Sam Hersbach and RaQuel van Haver) of the ‘Koninklijke Prijs voor Vrije Schilderkunst‘. Next to buying art and pushing artists, we will also curate three or four exhibitions per year. In september 2018 we presented ‘The Man Who Took the Subway’: 13 drawings by Lionel Plak, at HE.RO gallery. And in december 2018 ‘Time Capsule’ will open at Frank Taal gallery, where we will showcase works by Rotterdam artist Ab Knupker. At This Art Fair we present a double bill: subway drawings by Lionel Plak and tragicomic linocuts by Maarten Wendrich.